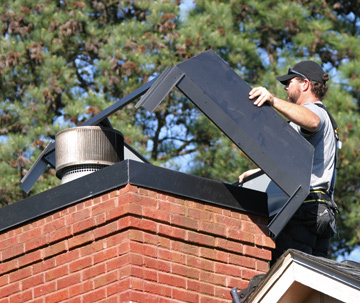 Atlanta chimney sweeps fabricate and install chimney rain pans, chimney shrouds, clean chimneys and handle all chimney repairs throughout the Atlanta area including Cartersville, Kennesaw, Woodstock, Suwanee, Brookhaven, Tucker, Roswell, Norcross, Fayetteville and many other towns. Water is a chimney’s number one enemy and the leading cause of chimney damage. The problems caused by moisture in a wooden chimney chase or masonry chimney include missing mortar joints, broken masonry, a rusty firebox, rotten wood, structural damage, and much more. A deteriorating chimney is a fire hazard. The simplest and least expensive preventative measure to take against water damage is the installation of a chimney rain pan and chimney shroud, which comes in a variety of styles and will add aesthetic appeal and functional water protection as a chimney topper. Many chimneys are actually wooden framed structures. Looking at the exterior, they may appear to be masonry; but, in fact, they are not. These chimneys have a different type of top all together. The base part is the rain pan. It is a flat piece of metal that covers the top of the chimney much like an upside down cake pan. The average life span of a rain pan is 12 to 16 years. When custom-built chimney toppers are needed, we specialize in helping our clients choose good quality chimney rain pains, and we make sure they are built right. Our metal comes pre-finished with a baked enamel finish to prevent premature rusting and oxidation. The enamel finish significantly extends the life of the chimney top. These custom metal tops are designed to be stronger by using a higher gauge thickness metal. One of our practices is to add extra supports where possible. In order to stay competitive, we provide these features at no extra cost to our clients. We also offer custom chimney shrouds, which are matching top pieces shaped to divert rain away from the chimney. The chimney shroud covers the termination cap in a very aesthetic way with an architectural styled peaked roof or decorative design to top off the chimney nicely. A decorative shroud will add character and value to your home. A dime-sized rust hole can cause thousands of dollars in framing and sheetrock damage that may not be covered by your homeowner’s insurance. Don’t take chances with your chimney’s chase cover. Ask your Chimney Solutions representative about your chase cover’s condition today. We also offer pressure washing of chimneys and chimney shrouds to remove dust, dirt and mold that may accumulate over time. Call to speak with your Chimney Solutions representative about your options for a custom chimney chase cover and/or decorative shroud today. As always, the quality and reputation you deserve at a price you can afford! Their Atlanta area Chimney Sweep technicians work in many towns including Marietta, Dunwoody, Duluth, Smyrna, Gwinnett, Cartersville, Woodstock, Suwanee, Brookhaven, Tucker, Roswell, Norcross, Fayetteville and more.